Multiple Exposure (Shooting menu): With this option, you can combine your next two to three shots. After you enable the option and take your shots, the camera merges them into one file. The shots used to create the composite aren’t recorded and saved separately. The Multiple Exposure option isn’t available in Live View mode. Image Overlay (Retouch menu): This option enables you to merge two existing Raw images. On the surface, both options sound kind of cool. The problem is that you can’t control the opacity or positioning of the individual images in the combined photo with your Nikon DSLR. 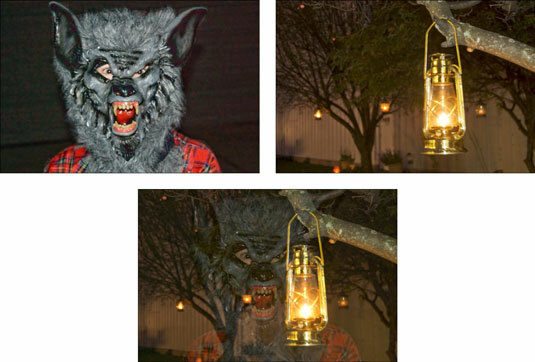 For example, the overlay picture would have been more successful if you could move the werewolf to the left in the combined image so that he and the lantern aren’t blended. And you might also prefer to keep the background of image 2 at full opacity in the overlay image rather than getting a 50/50 mix of that background and the one in image 1, which only creates a fuzzy looking background in this particular example. However, there is one effect that you can create successfully with either option: a “two views” composite. For this image, you use Image Overlay to combine the front and rear views of the antique match striker into the composite on the bottom. 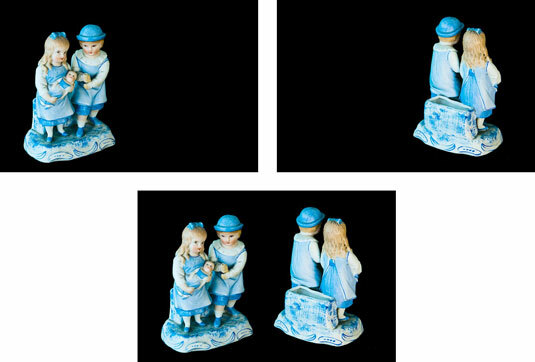 For this trick to work, the background in both images must be the same solid color (black seems to be best), and you must compose your photos so that the subjects don’t overlap in the combined photo. Otherwise, you get the ghostly portrait effect. Neither feature is designed to produce an HDR (high dynamic range) image, which lifts different brightness ranges from different images to create the composite. For HDR, you need software that can do tone mapping, not just whole-image blending.